All photographs on this page reproduced by permission and courtesy of the Chicago Park District Special Collections. Today's southern edge of Lincoln Park retains the general layout that was planned and built as part of a 1938 Worker's Progress Administration project. 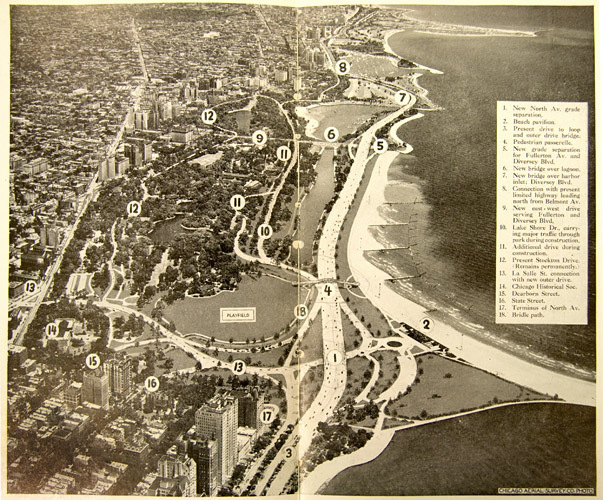 This 1935 photograph shows the park layout prior to the WPA redesign. 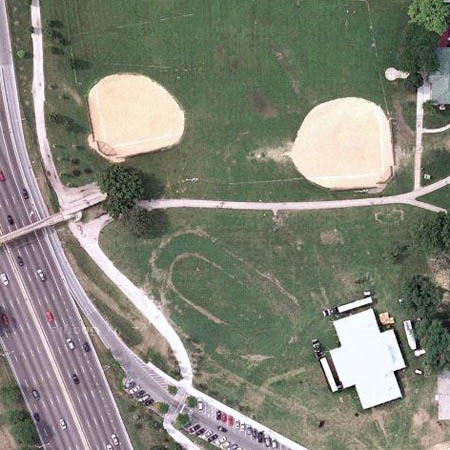 Since 1877, baseball diamonds have occupied the ground that was the City Cemetery potter's field. The left edge of the lagoon, above, represents the original lake shoreline. 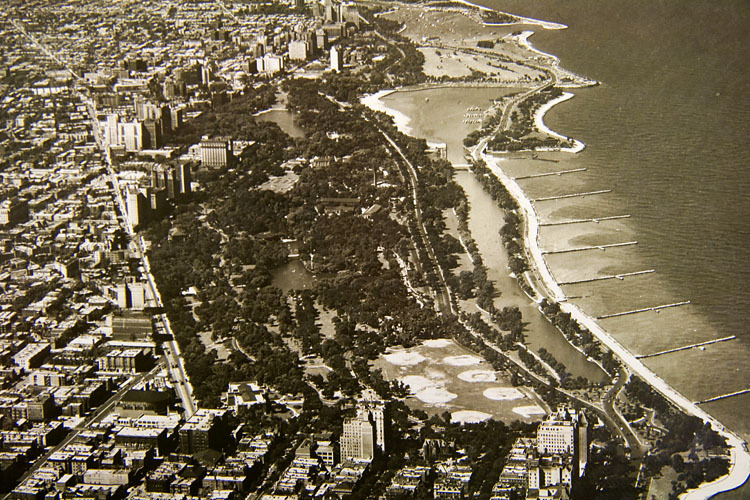 The 1938 construction shortened the lagoon, created a wider Lake Shore Drive, and introduced a new road into the park's landscape. The LaSalle Street connection truncated the ball fields and created more landscaped park grounds. This photo illustration shows the newly redesigned Lincoln Park, detailing the 1938 WPA project. The City Cemetery occupied the land from the bottom edge of the park as pictured, north to approximately where the number 12 appears, and from Clark Street (No. 13) east to what was the lake, here represented by the left edge of the lagoon. The column at the right reiterates the inset key, above. 1. New North Ave. grade separation. 3. Present drive to loop and outer drive bridge. 5. New grade separation for Fullerton Av. and Diversey Blvd. 6. New bridge over lagoon. 7. New bridge over harbor inlet; Diversey Blvd. 8. Connection with present limited highway leading north from Belmont Av. 9. New east-west drive serving Fullerton and Diversey Blvd. 10. Lake Shore Dr., carrying major traffic during park construction. 11. Additional drive during construction. 13. La Salle St. connection with new outer drive. 17. Terminus of North Av. This 1940 photograph shows the progress of the construction. The baseball diamonds have been reshaped, the lagoon has been shortened, and the lake shore is being extended outward. 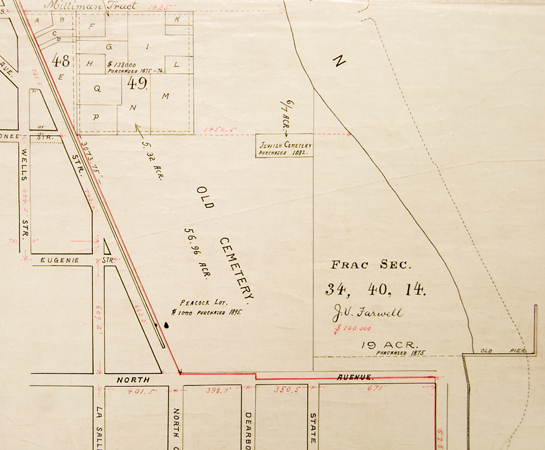 1895, Original unsigned plat map, permission and courtesy of the Chicago Park District Special Collections. This hand drawn map illustrates, among other things, the Farwell tract, which J.V. 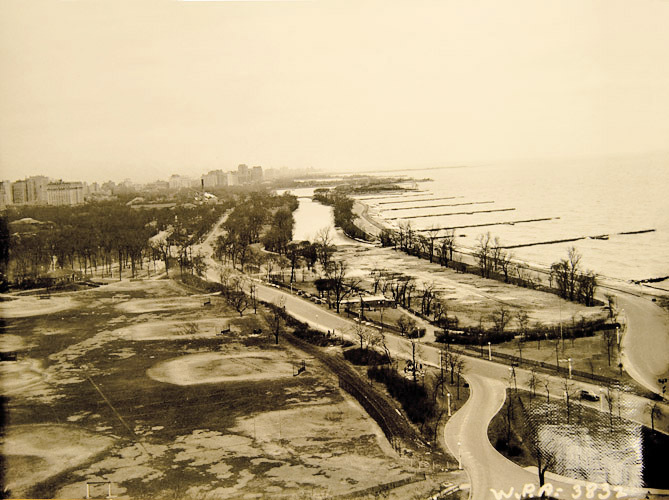 Farwell bought as a seven-acre lakefront parcel in the late 1860s. He constructed a pier on his property that jutted out into the lake, and over time he acquired twelve more acres of land. 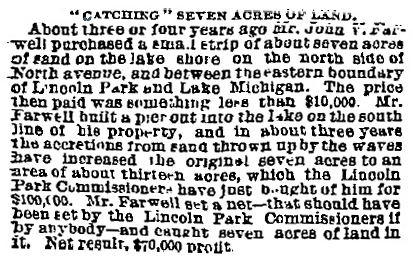 The sale of this land to the Lincoln Park Commissioners was completed in 1875, at a cost of $100,000. 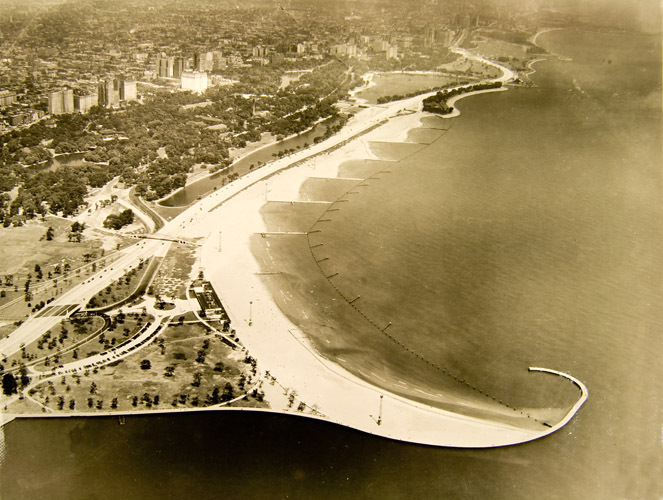 This 1941 view of the new, finished shoreline shows a wing-like extension at North Avenue, exaggerating the original Farwell Tract's pier that gathered sand to create his additional property. 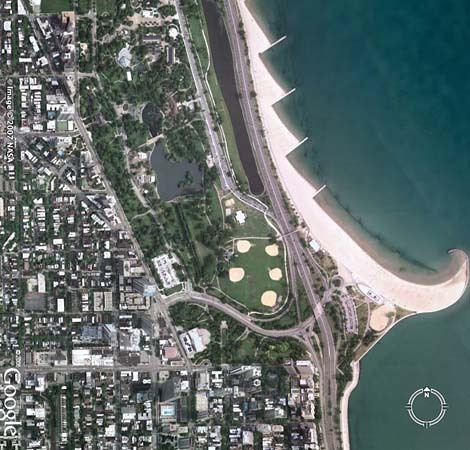 This contemporary satellite map from the Google EarthTM website shows how similar the layout of the landscape remains six decades after the 1938 WPA construction. The various aerial maps on this page, taken from high windows or low-flying airplanes tend to distort the layout of the park grounds. See a broader and interactive satellite map. 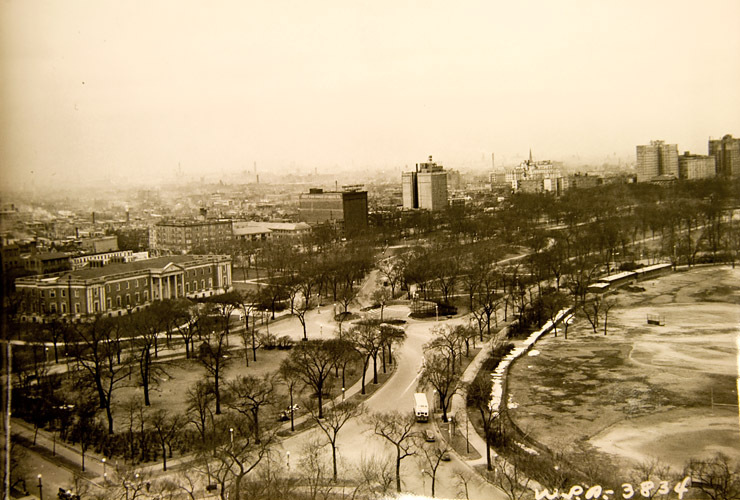 This 1938 pre-construction view, looking northwest from a North Avenue highrise, shows the original entrance to the Chicago Historical Society facing the park. During the 1931 construction of the Historical Society, skeletal remains from the City Cemetery were uncovered while excavating the museum's foundation. More remains were discovered during the museum's expansion in the 1980s. 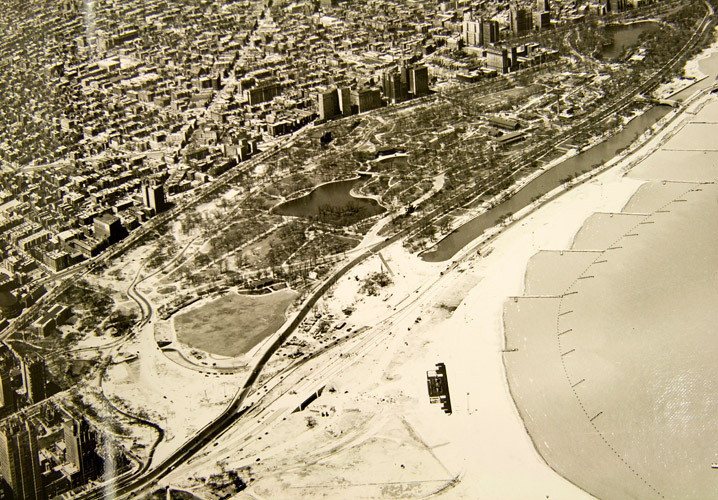 This WPA photograph shows the progress of the shortening of the lagoon before the new street was cut through the landscape. 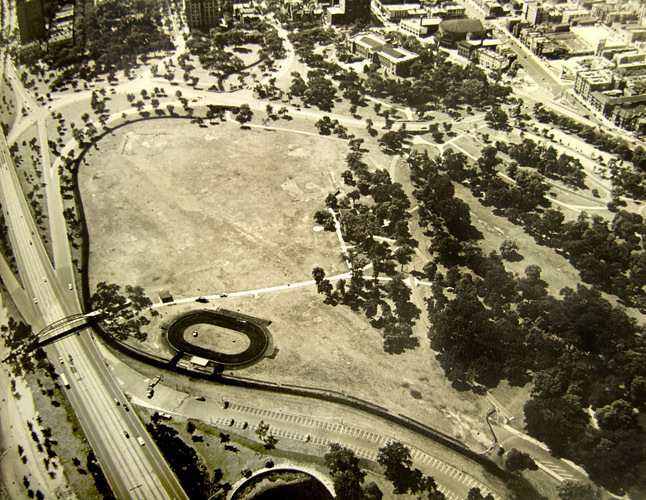 This 1948 view looking southwest, shows an oval horse warm-up track leading into bridal paths. The image also illustrates how "free and clear", in the original parlance, the park grounds have remained. This landscape has, with the exception of the installation of water and sewer lines, been virtually untouched more than several feet beneath the surface since its use as a cemetery in the 1860s. Near the top, right edge of this picture, running at a parallel diagonal to Clark Street is where the 1998 construction of the Chicago Historical Society's parking facility uncovered the skeletal remains of 81 individuals. This satellite view from the Google EarthTM website shows the ghost outline of the former horse track. The "T" shape at the right is a staging area for the Chicago Air and Water Show. Identification of the track and the "T" came from David Leeb, of the URS Corporation, who is heading the current transformation of these grounds into an artificial turf soccer field for the Latin School of Chicago, a K-12 independent educational facility located across North Avenue from the park.